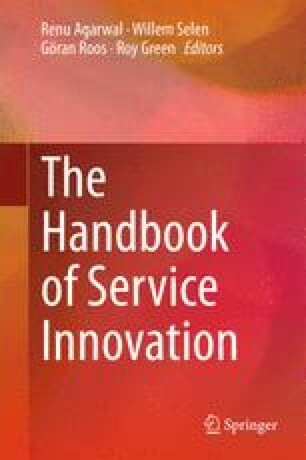 This chapter is about co-creative practices that can be used for the purpose of service innovation. It starts with an introduction to our core assumption that innovation is a deliberate activity and can be enabled and triggered through staged co-creative practices. The main reasons for co-creative practices are first, bringing different people together to share, make sense and to collaborate, and secondly, to rethink current and explore future possibilities. In line with Kelley’s ideology, “You can prototype just about anything. What counts is moving the ball forward, achieving some part of your goal”. We highlight the open-ended exploration practices familiar to designers, in which the practice of identifying problems goes hand in hand with creating solutions. The basis for exploration in this chapter is in engaging people in reflective and creative dialogues, and to situate activities in order to set frames for reflection. In practice, the co-creative practices emerge and evolve in a non-linear progress of stages that are partly overlapping and in relation with each other. This chapter, however, is organised through the use of four lenses: (1) insight generation, (2) concept exploration and development, (3) converging towards a specification and (4) transformative and implementation processes. The chapter introduces a number of examples and applied co-creative practices from various fields of service design. They address the co-creative character of many well-known tools such as role playing, context mapping, design games and experience prototyping. Finally, the chapter sums up the main considerations for the applications of co-creative practices, defining the purpose, utilising co-creative characters and developing facilitation capacity.